Redskins quarterbacks Kirk Cousins and Colt McCoy combined for four touchdowns, and the defense caused four turnovers as Washington won their fourth in a row in their final tune-up before the playoffs. Cousins only played a little more than a quarter, but it was enough to throw three touchdowns and set a team record for most yards passing in a season. Tight end Jordan Reed also set a team record for most catches by a tight end after catching four passes. Jamison Crowder, Rashad Ross, Pierre Garcon and Ryan Grant all caught touchdown passes. Running back Alfred Morris also rushed for 100 yards. Cowboys quarterback Kellen Moore threw for more than 400 yards and three touchdowns, but also threw two interceptions, including a key pick at the goal line. The Redskins will have to wait to see who their first round opponent will be out of the Seattle Seahawks, Minnesota Vikings or Green Bay Packers. After an opening kickoff through the end zone, the Cowboys started the game with the ball on the 20. Two short runs and an incomplete pass sent the offense off the field quickly. A familiar connection started the Redskins offense as Cousins found Jordan Reed for a first down. With that reception, Reed set a team record for the most receptions in a season. But the offense stalled and were unable to get another first down. The punt, however, pinned the Cowboys back on their own 6 yard line. The Cowboys offense still having problems, going three and out again. Trading field position, the Redskins punt team was able to get the ball into Cowboys territory for the offense. While punt returner Jamison Crowder couldn’t show his speed on the punt, he did it on the first offensive play – taking a screen pass 44 yards, down to the 3 yard line. On the next play, a play-action short pass to Ryan Grant let the Redskins put the first points of the game on the board. The Cowboys offense showed some life after 19 yard pass catch by Williams where he ran from one sideline to the other, trying to find a gap. A sack pushed back Moore, and two plays later, he attempted a deep pass that was picked off by Witten for his first interception of the year. The Redskins offense looked like they were ready to get the running game started, giving the ball to Morris twice, setting up a 3rd and 6. Cousins dropped back to pass, was pressured, but managed to toss a 39 yard pass to Garcon, who made a sensational catch and scored on the play. The Cowboys were looking for a spark and got it when McFadden found a gap and ran for 14 yards. However, the quarterback/center exchanged on the next play resulted in a fumble, which was recovered by the Redskins defense for their second turnover of the day. The offense was ready to make the Cowboys pay for the turnover. There was a heavy dose of Morris’ power running, moving the team down to the 3 yard line. After two incomplete passes, Cousins found Crowder for an easy pass and catch for their third score in the first quarter. The Cowboys continue to stop themselves on their drives. On a 3 yard run by Turbin, a Cowboys tight end picked up a personal foul in a scrum, pushing the offense in the wrong direction and brining up 3rd and 19. A short pass was unable to get a first down, and they punted again. Cousins continued to show off his excellent touch, completing passes to Crowder and Reed to set a new team record for most yards passing in a season. The drive stalled out short of the end zone, but Hopkins was able to knock a 27 yard field goal through, extending the Redskins lead. After the score, Washington Post reporter Mike Jones said Cousins was getting hugs and putting on a ball cap, likely signifying his day was done. Cousins was 12 for 15, for 176 yards and three touchdowns in a little more than an quarter’s worth of work. Once again, the Cowboys appeared to have one good play followed by two not so good plays. They couldn’t convert on a fourth down and appeared ready to punt. From the “why not?” playbook, they faked the punt and were able to grind for the first down, extending the drive. Moore was able to get some time in the pocket, finding Williams for 36 yards and putting them in the red zone. After a hard run by McFadden, defensive back Dashawn Phillips went down with an injury. Medical personnel were called to the field, and he was taken off on a backboard and cart. Jones reported he was alert, but was carted off with his head and neck stabilized by a brace. Moore hit Whitten with a short pass and the tight end was able to get the football across the goal line before going out of bounds. Colt McCoy came into the game as quarterback for the Redskins, and the offense continued to move the ball well. A mix of Morris runs and McCoy passes kept the team flowing. The two minute warning apparently took the steam out of offense with an overthrown pass and a near fumble by McCoy. 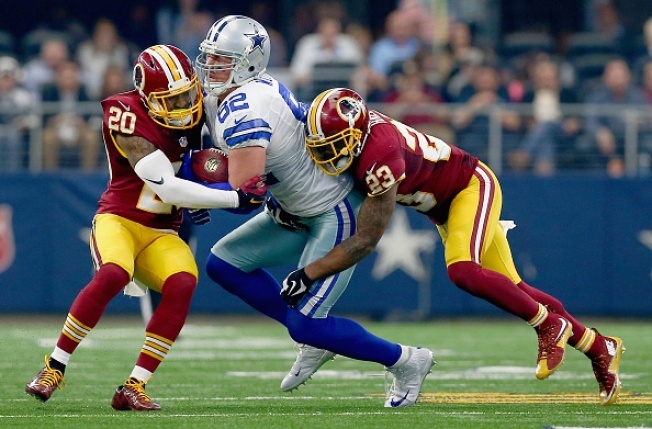 The Redskins were forced to punt, pinning the Cowboys deep in their own territory again. Moore was able to find a rhythm, connecting on three straight passes, moving them into Redskins territory. Another completion moved the Cowboys down to the 22 yard line with less than a minute to go in the half. Two more completions put them on the 5 yard line. Moore completed one more to Beasley and a touchdown. McCoy took a knee to run out the clock at the half. With many starters on the sidelines, the Redskins couldn’t get moving after the opening kickoff of the second half, going three and out. Another punt and penalty, the Cowboys were pinned deep once again in their own territory. A 30 yard run by McFadden moved the Cowboys out of the shadow of their own goal posts quickly. An incomplete pass, a short run and a sack once again forced Dallas to punt. Morris, Chris Thompson kept the ball on the ground, picking up a couple first downs. But a holding penalty pushed back the Redskins and brought up a long 3rd down. When in doubt, get it to a speedster. McCoy dumped the ball off to Crowder, who used his quickness to get a first down. The offense continued to feed Morris and Thompson, who got the team inside the 20 after 10 plays. Two short runs brought up another 3rd down. A pass to the end zone was incomplete. Hopkins came on for a short field goal to extend the lead. The Redskins defense came up strong, sacking Moore and batting down a pass before holding the Cowboys short of a first down. The punt went out of bounds at the 28 yard line. A holding penalty appeared to stall the offense as the third quarter ended. On the first play of the fourth quarter, McCoy found a wide open Rashad Ross for 71 yards and the wide receiver’s first touchdown of his career. After a kickoff through the end zone again, the Cowboys went to a modified hurry up offense, moving 67 yards in four plays to get them inside the 20 yard line. However, Will Blackmon decided he wasn’t going to let them in the end zone, jumping a route at the goal line and intercepting Moore’s pass and bringing out to the 1 yard line. The Cowboys defense decided they would do the scoring, pinning Morris inside the end zone and giving Dallas two points. The safety and ensuing kick gave the Cowboys good field position and they brought out the hurry up offense. After getting down to the 23 yard line, Moore took a couple shots in the end zone with no success. McFadden took a pitch to the left and appeared to have clear sailing for the touchdown. But a heads-up play by Blackmon stopped the score as he knocked the football out of the running back’s hands. The ball bounced out of bounds for a touchback. After getting the ball on the 20, Morris bulled his way for 23 yards, shedding would-be tacklers along the way. He followed that with an 8 yard carry and hit the 100 yard mark on the game. Two short passes couldn’t get the Redskins the first down. Tress Way put another punt inside the 20 yards line, his third such kick of the day. For the Cowboys, dumping the ball off the McFadden and letting him run or getting the ball to Whitten seemed to be their best plays. The Redskins defense appeared to be in a prevent defense, concentrating on not allowing a big play. By taking advantage of the short routes, the Cowboys used 12 plays to move 89 yards for a Moore to Beasley touchdown connection. The lead was trimmed to 11 with just over 4 minutes to go in the game. The Redskins were content to keep the ball on the ground, running out the clock. McCoy did throw the ball once - on a fourth down conversion.